The catfish import situation in the 1990's supplied some very interesting imports, mostly the so-called L-number plecos. Additionally, as the fishermen of the South-American rivers explored new areas to come up with new species, described, but rarely imported species started to become more available. One good example of this is the long-tailed Sturisoma, Pterosturisoma microps. Even though Eigenmann & Allen described the species in 1942, the first importation into Europe was not until 1990, according to Aquarien Atlas 5 (Mergus Verlag). Most pleco enthusiasts should know the genus Sturisoma. Unlike many other plecos, these elegant catfishes are excellent algae eaters, and they don't mind staying out of the dark corners of the tank even during daytime. They grow to about 20 cm, and are not too expensive either, at least not when compared to many other catfishes. P. microps shares many traits with Sturisoma. They reach about the same size, and behave in the same way. 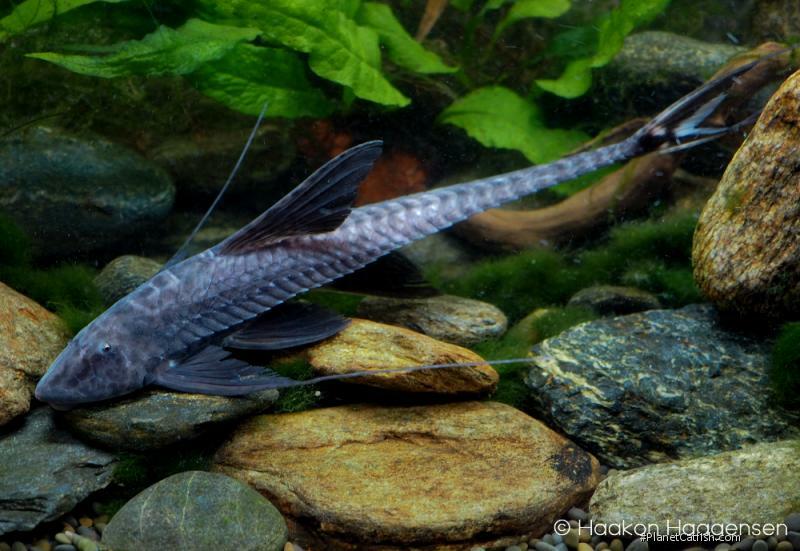 The colours of P. microps are not much to brag about, they are a uniform gunmetal grey black, with some nice white markings on the fins. The long filaments on the caudal and pectoral fins give the species an interesting, aesthetically pleasing look. The long tail Sturisoma is sometimes confused with Lamontichthys species, which are more similar in appearance to Sturisoma than P. microps is, at least in colour and shape. P. microps is somewhat flatter and broader than the common Sturisoma aureum, and has very tiny eyes. Perhaps its flat shape indicates that it comes from waters with strong current, and this is why they seem to be oxygen demanding in the aquarium. P. microps originates from the areas around Iquitos, Peru. Even though it's not very common in the trade, it's available on a regular basis from larger import / export firms of South American fish. The high price of this species also serves as a natural limit to it's spreading throughout the hobby. As far as I know, very little has been published about this species. Some basic information can be found in the aforementioned Aquarien Atlas 5, and German magazine DATZ published an article by H.J.Franke in no.2 / 99. This article only provides some very basic information, similar to that in the atlas, but it's still something to pick up. In the same Mr. Franke's book "Handbuch Der Welskunde" from 1985, the species is mentioned. In Dr. Warren E. Burgess' book "Freshwater And Marine Catfishes" from 1989 some lines about P. microps are included. It's obvious that the species is new and unfamiliar in the hobby. Recently I was able to obtain two large specimens of P. microps. They were a pair, which had been on their own in a tank for about a year in the store that sold them to me. The male had just started developing the 'beard' known from Sturisoma species. The female was broader than the male, especially when viewed from above, and somewhat lighter in colour. Unfortunately I lost the female after only a short period of keeping them, but I soon got 4 new adults from Glaser in Germany. Two of these seem to be females, because of their more 'chubby' shape. P. microps is not an easy fish to keep. They seem especially difficult to acclimate to new environments, and they also seem to be very oxygen demanding, much more so than with Sturisoma species. If the oxygen level in the tank is too low, or if something else is wrong, the fish will hang on the walls of the tank where the current is strongest. If the fish is thriving, it will settle on the bottom or on a piece of wood, but still it will stay where the current is strongest. High temperatures will make the level of oxygen in the water decrease, so preferably they should be kept at around 23 - 25°C. Erwin Schraml (pers. comm.) reported of a fellow aquarist who kept a group of 8 P. microps in a tank with temperature close to 30°C, and these specimens seemed to thrive, as he kept them under these conditions for about a year. It's also very important that the water quality is very good; clean and without nitrite. If the fish is stressed, for example if kept in less than perfect conditions, they will not eat. How and what to make them eat is a chapter in it's own! Perhaps smaller specimens are easier to acclimatize? Erwin only had his two specimens for a short period of time, because they refused to eat. He considers P. microps to be a specialized algae-eater. Schraml also wrote an article about P. microps and Lamontichthys filamentosus in Das Aquarium 303: 4-7 1994. I haven't read this, but would like to get hold of it. Franke indicates that the fish might be a detritus eater in its natural habitat. I keep my male from the original pair in a 720 liter. (200 x 60 x 60 cm) tank. This tank has only moderate water circulation. This male eats homemade shrimp mix, a mix of shrimps and vegetables like Brussels-sprouts and peas, and Spirulina. He really seems to like this food, but has only recently started eating well, after several weeks of just 'hanging around'. He also eats frozen adult brineshrimp when this is given. Based on this, I will say the species is pretty omnivorous; they'll eat anything offered when they thrive. The trick is to make them eat before time causes their death by starvation. They seem unwilling to eat until they have really settled down in the tank. Because of this, one should make sure that when specimens are purchased, they should have a nice, at least somewhat round belly. My other 4 specimens are kept in a 250 liter (100 x 50 x 50 cm) tank, which has a very strong circulation, but are still not eating much. I've only kept them for 2-3 weeks at the time of writing this, and they are not worryingly skinny yet. Catfishes like these are usually not very demanding regarding water parameters. However, trying to keep them at about the same levels as in their natural habitat would surely be the best solution. This would mean soft, slightly acidic water. The most important thing to consider, is keeping the water clean and fresh! To the best of my knowledge captive breeding of P. microps is unknown. Since the species seems more demanding than most, it wouldn't surprise me if this was also the case regarding spawning. Under the right circumstances (i.e. good, sufficient feeding, high water-quality/circulation, and lots of patience from the aquarist) it should be possible to achieve. Sturisoma species can actually be triggered to spawn quite easily if they are heavily fed with Spirulina, then the females will rapidly become ripe. Probably, Spirulina could have the same effect on P. microps. To get the females nice and fat is half the trick to achieve a successful spawning, this goes for plecos in general. It's quite likely that P. microps follows the same breeding pattern as Sturisoma. If so, the eggs will be laid on a relatively plain surface, for example a big plant leaf, a rock, a piece of wood, or even on the walls of the tank. Then the male will guard his offspring until they are swimming away from the nest on their own. The fry will usually not be chased or eaten by the parents, but it's probably best to keep the fry in a separate, smaller tank anyway. Sturisoma fry are hard to raise, because they are difficult to feed. I would assume this goes for P. microps fry as well. The problem is that the youngsters don't move around a lot, so the food has to be brought to them, instead of the opposite. Additionally supreme water quality is absolutely necessary, as they are very sensitive to water-pollution. It's quite a challenge, actually! My goal is obviously to succeed in breeding this wonderful and rare species. Although for the moment, my main concern is keeping them alive first and, secondly, ensure that they thrive. Then we'll see what happens. If I succeed in more than that I'll let you know! Zwei bemerkenseswerte Harnischwelse. Pterosturisoma microps und Lamontichthys filamentosus aus der Unterfamilie Loricariinae. Das Aquarium 303: 4-7. Etymology Genus: Greek, pteron = wing, fin + German, sturio = sturgeon + Greek, stoma = mouth This specific epithet refers to its small(mikros=small) eyes(ops=eyes). Sexing Males have a pentagon shaped pregenital scute, females it is more exaggerated into a star shape (i.e. has concave as opposed to straight perimeter). Distribution South America: Upper Amazon River basin.